The world's leading pension minds, investors, policy makers and academics gathered in Toronto on November 13 –15, 2016 to attend the OPTrust Global Pension Leadership Summit where longterm investment challenges and opportunities for collaboration were explored. Topics under discussion at the two-day Summit included global opportunities for institutional investors, the advancement of disruptive technologies and investing in a low interest environment. OPTrust President and CEO, Hugh O'Reilly noted, "We were delighted to welcome speakers and guests from around the world to share their perspectives and insights on how we can partner to find solutions to current and emerging investment challenges." "Collaboration isn't just about investing – people also need to collaborate to come up with and share new ideas. We focused on a number of key issues including the impact that climate change and shifts in the political landscape can present to investors. The conversations were both thought-provoking and enlightening. We look forward to continuing the conversation," O'Reilly said. Among leaders from the political, investment and academic worlds who spoke were the Plan's sponsors – the Honourable Kathleen Wynne, Premier of Ontario and Warren (Smokey) Thomas, President, Ontario Public Service Employees Union (OPSEU). As part of OPTrust's governance structure, one Government appointee and one OPSEU appointee fill the positions of Chair and Vice-Chair, with the roles alternating between Government and OPSEU appointees every two years. Vicki Ringelberg was named Chair of OPTrust's Board of Trustees, effective November 2016, replacing former Chair Michael Grimaldi, who remains on the Board. Ms. Ringelberg joined the Board in 2011 as a Government appointee and most recently served as Vice-Chair. Her career spans over 20 years in the investment industry, where she held various senior positions, including Chief Financial Officer and Chief Operating Officer at AIC Limited and Portland Investment Counsel. She is currently an independent finance consultant to a number of businesses. Ms. Ringelberg is a Certified Professional Accountant and holds an MBA from the University of Toronto. The Board also appointed Tim Hannah as Vice-Chair of OPTrust's Board of Trustees, effective November 2016. Mr. Hannah was first appointed to the Board in 2012 by OPSEU. He is a Senior Environmental Officer with the Ministry of the Environment and Climate Change in Peterborough and a strong union activist, having held several local positions including President of Local 341 in Peterborough. Mr. Hannah holds a Bachelor of Science degree in economics and geography from Trent University. He has also obtained the Chartered Director (C. Dir) designation from The Directors College (a joint venture between McMaster University and The Conference Board of Canada). By the time you read this article, Sandra Snider of Thunder Bay will be retired. And while she's a little apprehensive about life after work, she's confident that both she and her husband – already an OPTrust retiree – will be OK financially. Ms. Snider started off as a Residential Counsellor at the Northwest Regional Centre back in 1981. That's where she met her then future husband, Greg, as they both started work with the Ontario Public Service on the exact same day. When the facility closed back in 1993, she recalls, "we were both surplused. Greg was offered a position with the Ministry of Community and Social Services and I was offered a position at the Office of the Registrar General, which had just recently moved to Thunder Bay from Toronto." She chose a new career path – an office job – because it meant she could retain her pension. Talking to OPTions just days before her retirement, she was feeling a slight tinge of anxiety. "Retiring was something I talked about with enthusiasm for the last five years since my husband retired," she says. "Freedom 55 – isn't that what television says we all aspire to? Now I am apprehensive about what I will do, how I can contribute and (whether) I will have a reason to get up in the morning." However, her retired friends "assured me I will love it," and say "they don't know how they had time to work," she says. Her planned first two weeks off were to include baking and making sandwiches for the church tea. "Making tourtiere for a fundraiser, cooking supper at Shelter House and working at the Regional Food Distribution Centre. I am starting a new adventure and a new phase in my life. The only thing I am sure of is that financially Greg and I will be OK thanks to our OPTrust pension." She views her OPTrust pension as her "financial plan." Both she and her husband consulted a financial planner a decade ago about retiring, and were assured that the OPTrust pension would allow them to "continue to live in the style we had prior to retirement." The planner advised them to watch their spending in the first couple years of retirement – most people spend too much, she says. "We don't have a lot of savings but I am feeling OK. I know both our pensions will be enough for us to be comfortable," she says. "I truly appreciate my pension. I have friends older than me who have no pensions to speak of and who have indicated they have to work until they physically can't work anymore. They had no way of saving for retirement and CPP alone won't cover their bills." Her husband has found that his OPTrust pension provides roughly the same take-home pay that he had at work, when expenses like travel and lunches out are factored in. His cheque arrives on the 26th of every month "without a problem." Her dad passed away recently at age 75, after running his own small business. "He was still working – he had lots of someday plans, and now someday will never come. I plan to do my someday plans now that I am retired," she says. Those plans include a trip to Ireland, taking her mom and husband to the Maritimes, and possibly a cruise. Ms. Snider, a past Executive Board Member of OPSEU, keeps an eye on the news. "With the recent election in the US I worry about the fluctuations in the stock market and what it will do to investments. But I read OPTrust's annual report, and I know the fund is well run and the investments are diversified for the safety of the Plan and its members," she says. 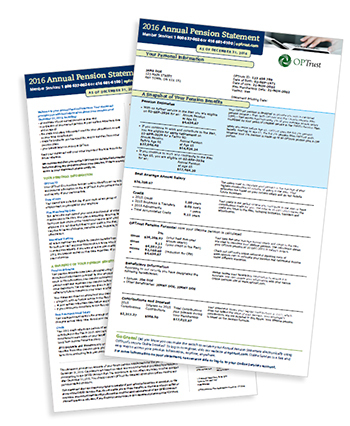 Once a year, members of the OPSEU Pension Plan get to preview their retirement future via the Annual Pension Statement (APS) they receive from OPTrust. the personal information we have on file for you. One of the great things about defined benefit pensions like that offered by OPTrust is that you have a very good idea in advance of what your future pension will be. Other retirement savings arrangements, such as RRSPs, can't accurately predict what your post-retirement income will be. Full information on what's in this important annual document can be found on our 2016 APS page. The 2016 APS will be available between February and April 2017. We recommend you take a few minutes to review it and let OPTrust know if your beneficiary, spousal and address information needs to be updated. It's very important for you to keep OPTrust up-to-date if your email address and/or home mailing address change. If we don't have your current information on file it can delay your receipt of your statement and other important correspondence. Note that when you update your address with your employer the update is not automatically captured by OPTrust, so do take a few additional minutes to update us as well. If you have questions or want to report your change of mailing address, call us at 416 681-6100 or toll-free at 1 800 637-0024. You can contact OPTrust Monday to Thursday from 8 a.m. to 6 p.m., and Fridays 8 a.m. to 5 p.m.
On November 16, 2016, the Government of Ontario and OPSEU announced changes to post-retirement insured benefits that will impact members of the OPSEU Pension Plan who start their pension on or after January 1, 2017. The Government is in the process of preparing information that will explain the changes and outline the eligibility criteria, coverage terms and premium rates. Information will be posted on optrust.com as further details are made available from the province. In October 2016, the Canada-Spain Chamber of Commerce awarded Globalvia their 2016 company of the year award. The Canada-Spain Chamber of Commerce recognized Globalvia for its contribution towards enhancing closer collaboration between the business communities of Spain and Canada and for its efforts to improve the relationship between the two countries. The award recognizes the successful investment by OPTrust and our partners in Globalvia, to help further grow the business and reinforce its position as a leading player in its market. OPTrust President and CEO Hugh O'Reilly attended the Canada Business Day Celebration at the Canada-Spain Chamber of Commerce where the award was presented. "I am pleased to be here today with Globalvia to receive this award and congratulate them on their role in strengthening the relationship between Canada and Spain," O'Reilly commented. "As a global investor, OPTrust consistently seeks to strengthen our relationships in jurisdictions in which we invest. I thank the Canada-Spain Chamber of Commerce for this recognition," O'Reilly said.